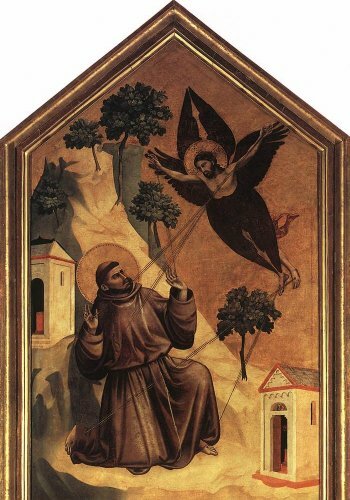 This is without doubt the most important image in Franciscanism. 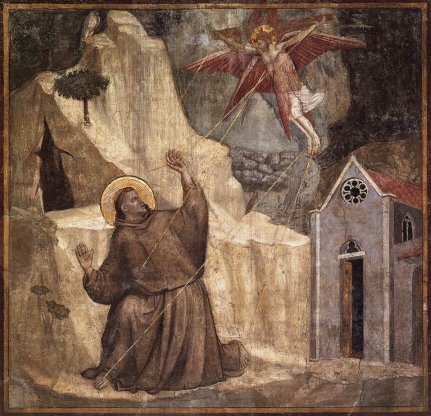 Francis receives the five stigmata, identifying him as the Second Christ, Franciscus alter Christus. 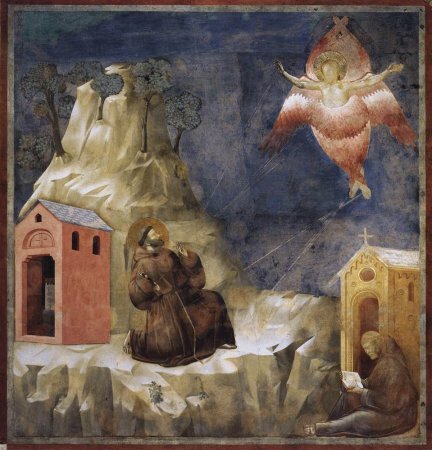 Francis is at the hermitage on Mount Verna; Brother Leone is with him in the Upper Church fresco. The angel in this fresco is a seraph. It has no visible features, which may be due to damage. It has been said that Longinus, the soldier who inflicted the wound in Christ's side, appeared in the image, but it is not clear where he would have been. The other two versions are sharper, more powerful images. The identity of the seraph is made clear: it is Jesus Christ. The Bardi image includes a cross, while the Louvre panel is a particularly distinctive depiction of Christ, making Francis's connection with Him crystal clear to a lay congregation. In all three images the stigmata are beamed to Francis from the location of the stigmata on Christ's body.